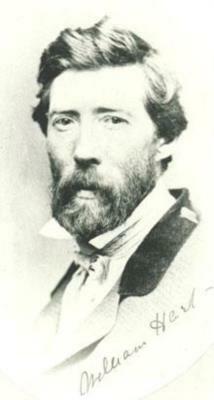 William Hart (March 31, 1823 – June 17, 1894), was a Scottish-born American landscape and cattle painter, and Hudson River School artist. 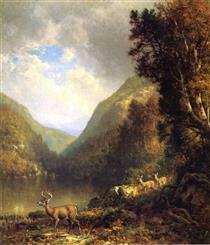 His younger brother, James McDougal Hart, was also a Hudson River School artist, and the two painted similar subjects. He studied under Jules-Joseph Lefebvre. William Hart (sometimes erroneously referred to as William M. Hart or William McDougal Hart) was born in Paisley, Scotland, and was taken to Albany, New York in 1831 by his family. He was apprenticed to a decorative painter in Albany, New York and Troy, New York, and his first artistic experience was in decorating the panels of coaches with landscapes. He also spent time as a portrait painter, likely after 1834. He toured the mid-western States, predominantly Michigan, during the late 1830s seeking portrait commissions, and was unsuccessful. He exhibited his first work at the National Academy of Design in 1848, and returned to Albany permanently in 1849. In late 1849, he was underwritten by a Dr. Ormsby to travel to Europe to study landscape painting. He painted primarily in Scotland until 1852, after which he returned to Albany, New York, and then in 1853, moved to New York City. By the time he returned to America, Hart had shifted his energy to landscape painting. 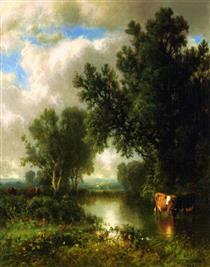 Like most of the major American landscape artists of the time, Hart settled in New York City, where he opened a studio in the Tenth Street Studio Building in 1858. In 1865, he was elected President of the Brooklyn Academy of Design. Hart became a full member of the National Academy in 1858, and continued to show his paintings there regularly through the mid-1870s. He also exhibited at the Brooklyn Art Association and at major exhibitions around the country. 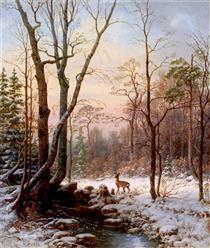 Hart was a member of the American Watercolor Society, and was its President from 1870 to 1873. 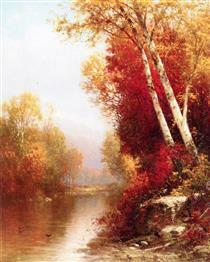 His mature landscape style embraced the mannerism of the late Hudson River School by emphasizing light and atmosphere. He became particularly adept at depicting angled sunlight and foreground shadow; the best examples of this are: Seashore Morning (1866) in the Metropolitan Museum of Art, New York; After the Storm (1860s) in the Museum of Fine Arts, Boston; The Last Gleam (1865) in the High Museum of Art in Atlanta, Georgia; Sunset in the Valley (1870) in a private collection, featured on pp. 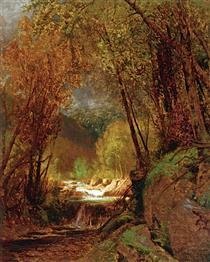 82–83 of All That is Glorious Around Us: Paintings from the Hudson River School by John Driscoll. 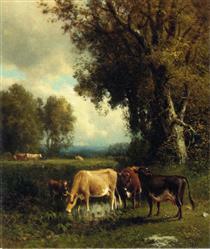 Later works are indicative of Hart's prolific and occasionally formulaic paintings of cows. 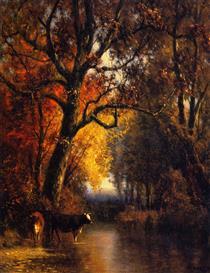 Cattle were a popular motif in Hudson River School art, and nearly every artist included them in at least some of their landscapes as diminutive symbols of man's harmonious relationship with nature. Some artists, including William and James Hart along with Thomas Bigelow Craig, made a specialty of cow portraits. 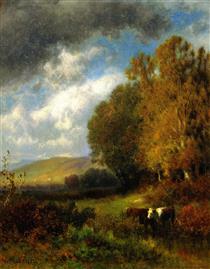 These paintings, which were very popular with late-19th-century American collectors, typically featured several cattle grazing or watering in the foreground or middle distance with the landscape playing a supporting role as a bucolic backdrop. G.W. Sheldon wrote in 1879 that Hart's later landscapes "may be found in almost all the auction-rooms where pictures are sold, and in almost all the principal private collections in the Atlantic cities."